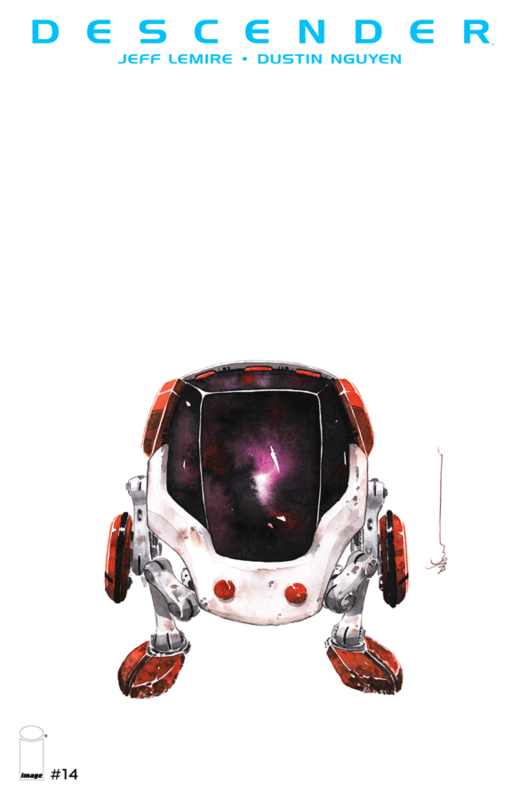 I never look forward to writing a less-than-exuberant review of the work by Jeff Lemire and Dustin Nguyen on 'Descender.' And to be frank, Nguyen is still killing it on the artistic side, with beautifully conceived watercolored panels. I'm not sure the thinking behind three backstory-driven issues in succession with the main plot inching forward ever so slightly. The latest subject of development is surprisingly the robotic dog companion of TIM-21, Bandit. Unfortunately, this outing is the weakest of the two other profiles we got - TIM-22 and Captain Telsa. If these issues had been spread out within the first fourteen issues it may not stand out so much but it's odd to delve into these characters' backgrounds three issues in a row. While TIM-22's story was heartbreaking and Telsa's unsurprising but revealing, Bandit's has even less to offer readers. We revisit the day of the attack of the Harvesters from Bandit's point-of-view. From the time Andy's mom put him on the escape shuttle to the time TIM-21 is reactivated 10 years laters. Bandit is left to his own devices, mostly powered down, roaming the halls full of dead miners except for an awfully resilient rat. It's pretty uneventful, caption-less and quite honestly feels like filler. Nguyen continues to amaze with stunning visuals. His mastery of conveying solitude with a wide lens, evoking emotion from a robot, using negative space to steer the eyes, the art propels the story as well as the words. It's this issue's saving grace that it's so beautiful and absorbing when you look at a page illustrated by Nguyen. I might be holding 'Descender' to a higher standard. With talented creators like Lemire and Nguyen I expect so much more as they've demonstrated in this series. Lemire has a master plan I'm sure and while I feel these last three issues were missteps, there's some major developments about to happen so there's no need to abandon ship just yet.